It’s been six years since it was legal to haul a pot full of red or blue king crab up out of Juneau area waters and take them home for a crab dinner. The Department of Fish and Game said in a Friday news release that the summer personal use red and blue king crab fishery will open for five days: Thursday, July 27, through Monday, July 31. The order is for Section 11-A, which includes Gastineau Channel, Stephens Passage and part of Lynn Canal. The agency is opening the fishery at a reduced harvest level. 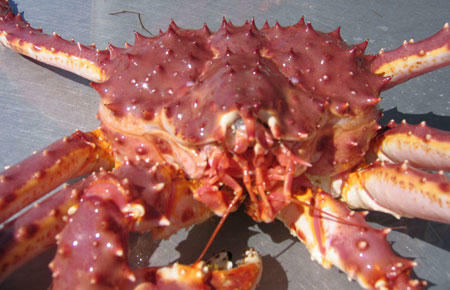 It will allow each household to take only two male crab total for those five days. The daily limit is also two males per household permit. Corey Mahar is thinking about going crabbing. Mahar said he was a little boy on the water with his family last time he caught king crab about 15 years ago. He remembers good times bringing the boat back in and cooking crab right away. Mike Wiley is more disappointed in the two-crab restriction. “Yeah, it’s a pretty pathetic bag limit,” Wiley said. Wiley said he’ll probably go crabbing further north in a different management area because the reduced Juneau area harvest isn’t worth the effort. Corey Mahar is excited for the chance to relive some childhood memories. “Looking over the side and seeing that red pot coming up, there’s no other feeling like that,” Mahar said nostalgically. But, he too hopes that sometime soon managers will say it’s OK to get more than just two crabs. If you’re going crabbing next week, Fish and Game said you need to pick up a summer king crab permit from their office on Douglas Island. You’ll also need a resident sport fishing license if you’re 18 or older.